I’m Erin from Technology Erin*tegration. I am excited to share my technology twist on close reading using iPads. Thanks for having me, Rachel! Just as there are many models for close reading, there are a multitude of apps that will support your students in digging deeper into a text. 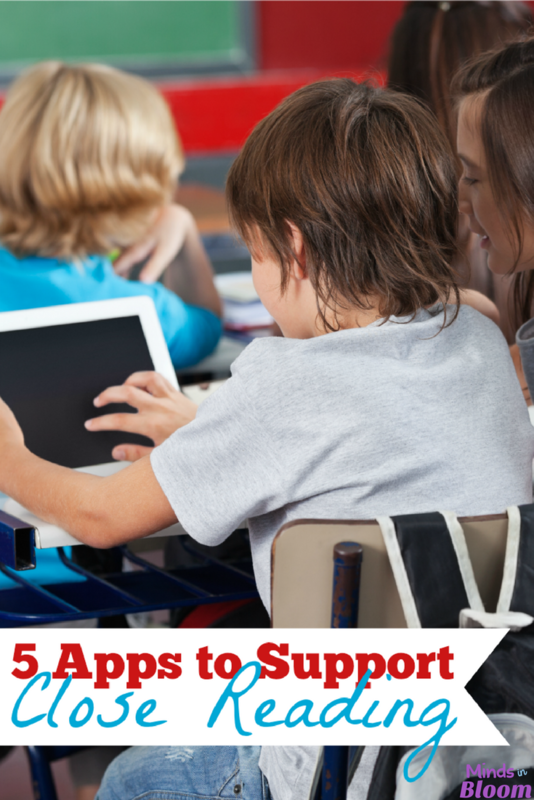 I am sharing my five favorite free apps for annotating and note taking on the iPad. These apps will work with any book or reading passage and can be used for each step of the close reading process. 1. Paperport Notes is my go-to app for close reading. Offering a robust selection of tools, including sticky notes, highlighting, voice-to-text capabilities, importing and exporting .pdf files, and the ability to add multiple pages from a book to annotate in one set of notes, this free workhorse app can be used for any close reading task. There are three ways students can add text in Paperport Notes: by downloading a .pdf directly from a URL, by taking pictures of the text, or by importing a .pdf shared in Google Docs or Dropbox. In my classroom, the students typically take pictures of passages from a text they are currently reading. After annotating they save each note set in the app. Notes are quickly retrieved for the “discussion” portion of our close read. Since we are not 1:1 with iPads, I like that this app will save multiple note sets in the app so several students can share the same iPad but be doing different work. 2. GlowNote Free is for amped up annotating with fancy colors, fonts, stickers, and effects. If you are trying to infuse your close reading with excitement and possibly give yourself a headache while assessing your students’ work, I would use this app. We have used GlowNote to find the heart of a story or the main idea of a passage. Students search for the main idea, take a picture of a scene in the story, and then write, underline, or circle their evidence. Then, students can use the blinking borders, neon effects, and emojis to make their annotation sing. This app does have ads so only use this if you have prepped your students with an iPad safety lesson. Students can email finished GlowNotes to you. 3. Skitch can be used to draw or label an image. Skitch will save any work as an image, so students will only be able to annotate one page of reading at a time. Skitch is also limited in that students must take pictures of a passage – there are no .pdf importing features. However, I recommend Skitch for adding annotating marks like arrow, hearts, exclamation points, question marks, emojis, or any small symbol that can be written with your finger. We have used Skitch to label graphic and text features in a nonfiction text and to identify context clues for unknown words. 5. Sticky is a free app for adding sticky notes and pictures to a background. Students would take a picture of a passage from a book they are reading. They can upload their image and then add various sticky notes around the text. Students cannot underline or write on the text, and there are no .pdf imports or exports. However, my students like that you can change the font and color of the stickies, too. I use this app if I want my students to write connections, make inferences, or make predictions on stickies. Students can take a screenshot of their work to save to the iPad camera roll. You can download an activity packet featuring making inferences using the app here. The packet also includes step-by-step visual directions for your students. We recently used the activity packet to create inferences using clues we saw at home or at school. Learn more creative ways to “Erin-tegrate” iPads into instruction at my blog, Erintegration, or connect with me on Pinterest, Twitter, Instagram, or Facebook. I am a current 3rd grade teacher with a Masters in Education and 10 years of experience in the classroom. I am also my elementary school’s technology integration facilitator. When I’m not teaching or creating iPad activities for my store, I’m reading, playing, and being silly with my twin toddlers. You are brilliant! What a fabulous idea to use these apps to help engage our kiddos and improve their CLOSE READING. …I love the Sticky app too. I just purchased the lesson for Sticky Note and I love it! Would you be willing to share a sample of a thinglink annotation? I’d love to see how it is used for this. I could not find an on-line example.